Randy walked into Room 232 in Schuyler Hall holding a small ripped piece of paper. “Oh, I didn’t know you were going to be here,” he said when he noticed Brittany in the room. Brittany had put up fliers asking for ten volunteers to do a sensory deprivation experiment. Each volunteer would $200. “I’m just here for the money,” Randy said. “I mean, anything is better than the mascot they have now,” Dr. Coot held up a poster with a Native American in a bright rainbow-colored headdress smoking a cigar and holding an axe in one hand and a jug of alcohol in the other. BORTON was above the Native and SAVAGES was underneath. “I’m not seeing the issue with it,” Dewey snarked. “I’m shocked our school hasn’t been burned down to be honest,” Dr. Coot said. Volunteers had to spend an hour in the sensory deprivation tanks and then talk to Brittany about what they thought about while in the tank and how they felt. Randy laid in the tank and stared at the back of the door above him. Since it was dark, he couldn’t actually see anything. It was also deathly silent. I’m horny, he thought. Actually, I’d rather just have a girlfriend. I miss having a girlfriend. How can I miss having what I’ve only had one of? I wonder how Elizabeth is doing. Her kid would be about six months old now. When did we break up? March? She got pregnant in April? May? Randy’s eyes went wide. What if it’s mine? I know she slept with what’s-his-name, like, right after we broke up. What if it’s mine and not what’s-his-name? I could be a father. I should look Elizabeth up when I get out of here. He smiled--at least, he thought he smiled. I should’ve peed before getting in here. I’ve never had to pee so bad in my life. I… Randy almost seemed to see something. “Dad?” he asked out loud. “So basically you just want us to be able to slap a sticker on a hat, shirt, or poster and call it good?” Dewey asked. Dr. Coot slid all their work into a nearby trash can. “Don’t worry, I got another idea,” Dewey winked. “So what did you experience? What were you thinking about while in there?” Brittany asked Randy after his time in the tank was done. “How much I had to pee mostly,” he said. “Oh,” she hung her head. “Presenting...the brand new, cost-effective mascot for the Borton College Savages,” Dewey announced. Dr. Coot turned a bulletin board around to show the administration their prized work. “Yes, the star of The Wonder Years and The Princess Bride, Fred Savage,” Dr. Coot responded. “We just printed the head of Fred Savage onto a piece of paper and taped it over the Native American head. It’s cheap. It’s effective. And we’re still the Savages,” Dewey said. “But Dewey? What if I’m not a fan of Fred Savage?” Dr. Coot asked. Isn't the Super Bowl next week? Ah, who cares? 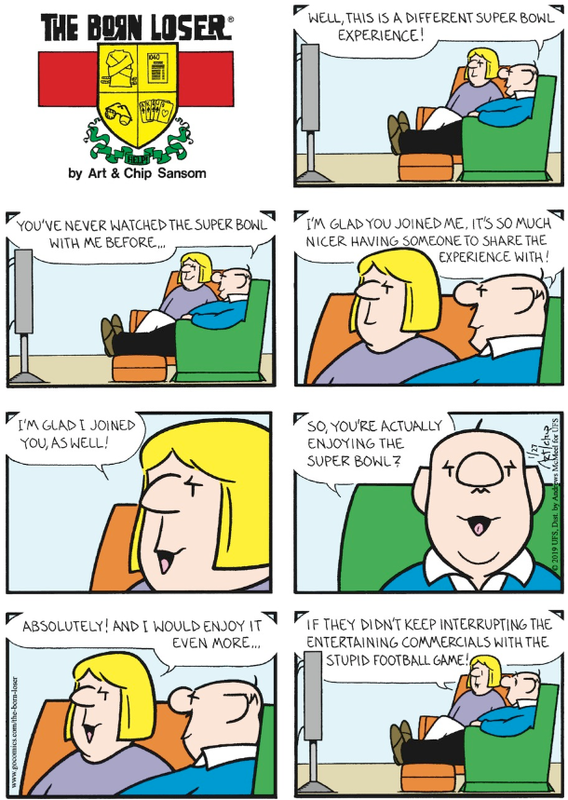 I went through my archives because I found the notion that Gladys has never watched the Super Bowl to be a blatant lie and none of the comics that would've posted on Super Bowl Sunday are about the game or even watching the game. You got me this time, The Born Loser. You got me this time. If you would like to support my writing or research, you can buy me a coffee over on Ko-Fi. No commitment or subscription required.